This photo is from yesterday's Sharon Craft Fair - that annual event on the green that brings people from all over the state and beyond to show their wares. We always enjoy strolling around the booths, visiting with neighbors and sometimes even buying things. This year we could have bought a hermit crab in a custom-painted shell ($8), a curtain tassel made from an old ceramic salt shaker ($35) or a variety of doll clothes, tied-dyed t-shirts, ceramic things for the mantel, birdhouses, jewelry and much more, not to mention these hand-made plaques. We didn't buy anything. But I took a lot of pictures - the best of them are here. 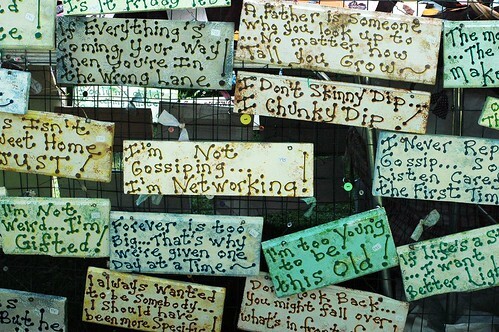 I love these plaques what fabulous quotes :o) I think I would have wanted to buy them all! My girlfriend, who lives in Ohio, absolutely adores craftfairs and always writes me about that. Even sends me goodies, from time to time and always they are so beautifully made and intersting. Love these signs and other crafts on your 'more pics' blog. Nice dog too! haha some of them are very witty and funny. have a great week Jenny! Very nice pics-- thanks for the link to the other shots--I loved the honey display!!! I'm too young to be this old. No more to be said.